This breakfast super hydrating smoothie is a simple and delicious elixir of life. Packed with vitamins, this drink promises to give you the energy burst you need in the morning. 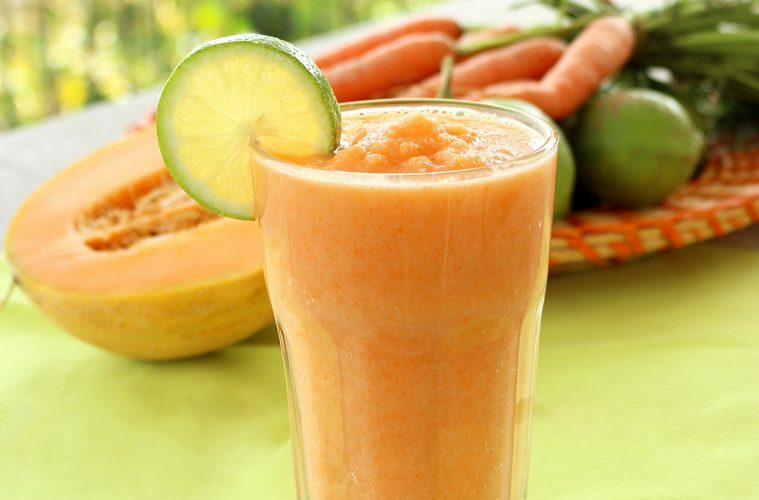 This smoothie is super hydrating, so it’s perfect for the beautiful sunny spring days. To make it, I’ve used simple fresh ingredients such as tarty Granny Smith apple, sweet and crunchy carrots, and a delicious cantaloupe melon. All you have to do is mix together all the ingredients, and in less than 5 mins you get one of the best smoothie you can dream of. Delicious, colorful and oh-so-good-for-you. Looks a great deal to me. Enough, time for you to get all the ingredients grab a smoothie maker and start your day at the best! Scoop out the flesh of the melon and transfer into a high glass. Add the carrot and blend with an immersion blender. Add the diced apple and blend a little more. Pour the yogurt and lime juice into the glass and blend all ingredients until smooth. Enjoy and good morning!